It’s that time of year again where everything is growing by leaps and bounds. Your cattle have made it through the winter and are feasting on the newly acquired grasses and the new calves are making good weight gains. This unfortunately also means that disease carrying pests such as horn and face flies, lice and mosquitoes are becoming abundant and are ready to reek havoc on your herd. Enter the cattle oilers! During the spring and summer months, cattle farmers are looking for healthy weight gains in their animals, but unfortunately, there are many insects looking to feed on farm and ranch animals that can disrupt the health of not just your cows, but all of your livestock. These pests can also carry and spread debilitating diseases as well. The horn fly is usually seen riding on the backs of cattle, where they can burrow all the way down to the animal’s hide. Once there, they’ll bite repeatedly throughout the day drawing blood. It’s estimated that each fly can bite 20 or more times a day, and that’s just one fly! This constant biting creates stress in its host and creates an itching sensation. This itchiness disrupts grazing time and interferes with weight gains. With milking cows, the stress and discomfort can lower output and when nursing, can cut calf weight gains as well. Another very common disease spreading fly is the common face fly. This fly feeds on external fluids, most commonly from the eye. The irritation to the eye is particularly annoying and the constant peskiness as the fly tries to access the fluid creates stress, limits grazing time and can spread disease such as pinkeye throughout the herd. Pinkeye is very serious as it can cause not only discomfort but can lead to blindness. Fortunately, there is help out there for our livestock. 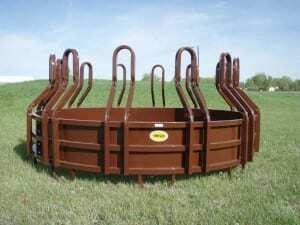 Livestock oiler designs are for the most part pretty straightforward, effective and simple to use. They provide effective pest control and best of all, some are self-applicating! The ear tags are popular and can be effective but has some disadvantages that self-applicating oilers do not. Tags require that you run your cattle through chute and put them through a stressful environment to physically attach the tag. This also requires extra man-hours and increases the potential for injury. Ear tags also lose their effectiveness and don’t offer full-strength protection year-round as their potency diminishes over time. This requires that they be removed and replaced with another ear tag, costing time, money and stressing the animals once again..
A ‘one-time’ topical treatment also wears off over time, degrades in the rain and needs to be re-applied to maintain it’s performance and effectiveness. To provide constant and effective livestock pest control, a full-strength application needs to be maintained throughout the season. One of the great advantages of Cattle Oilers is that the pesticide is consistently self-administered. They rely on the animal’s natural instinct to rub and scratch areas that bother them which applies insecticide right where it’s needed. This is especially true with the brush oiler designs as they can be used to remove winter hair, nasty pests and be an effective applicator. Not only are animals able to apply fly protection by themselves, but the constant use of the brushes keeps maximum repellent effectiveness consistent throughout the fly season. 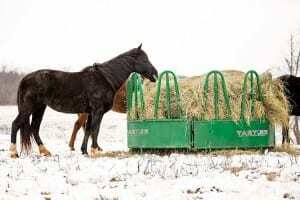 There’s no need to reapply anything to the animals as the season goes on as they are keeping themselves protected! One of the most popular oiler designs is a tank that holds insecticide coupled with strong brushes for application. Typically a top brush is mounted on a steel spring while a side brush is mounted through a bracket to a wall or post to provide the support needed. As livestock rub up against the brushes the liquid is applied and rubbed into their coats. This is an extremely effective method of application as it gets down into the hair of the animal for maximum effectiveness. The brushes are so desired by cattle that cattle groomers are offered for removing winter and excess hair. They are the same as the oilers, but they don’t dispense insecticide and don’t use or need a tank..
Another oiler design uses a tank wrapped in felt with a mop used as an applicator. Typically hung in a mineral feeder or traffic alleyway, these gravity fed systems are excellent for keeping face flies at bay. A rounded tank with small holes in the sides will ‘leak’ insecticide when tipped by anails as they go by in an alley or feeder out of a feeder. The small holes release liquid to the felt that is wrapped around the tank and held in place with wire mesh before it is then released to the mop itself. This prevents constantly leaking and provides the liquid only when in use. Below is a picture of a cattle oiler with mop being used in an upright mineral feeder. As the cows goes in for the mineral, the animal is gently blanketed with the oiler mop and the insecticide is applied automatically. A simple yet effective design for sure. These are not the only types of oilers being used in the industry but they are very popular and used across the country for effective pest management. 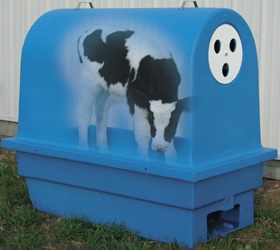 Always consult your veterinarian for the appropriate insecticide or pest repellent to use before applying to your herd. 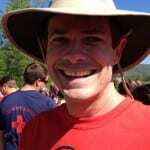 Please see BarnWorld.com for a large selection of livestock pest controls and feel free to call 720.238.2190 anytime! 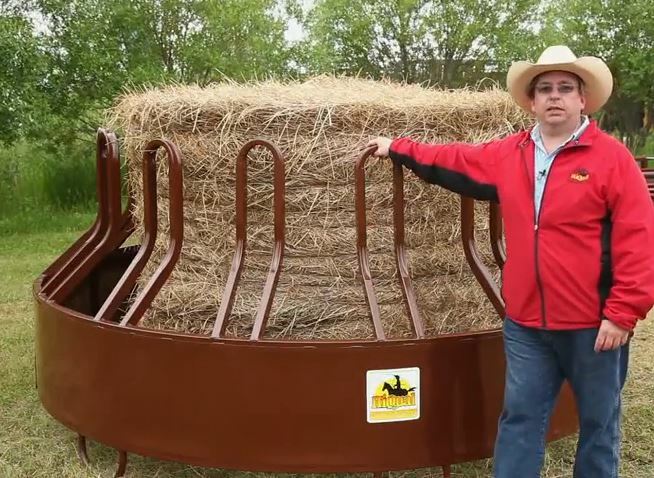 Here is a quick re-cap of the new 4.5 bushel Osborne Pig Feeder that automatically switches from a traditional gravity fed feeder to a mechanical feeder all on it’s own! Keep the feed in front of your pigs and eliminate the ‘play waste’ as they grow automatically with this specially engineered feeder from Osborne. Pig Feeder Review – gravity to mechanical automatically! 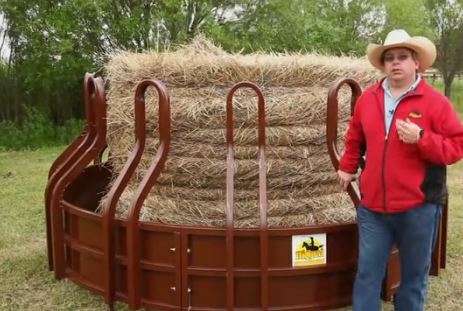 Osborne Industries, the leader in hog feeding equipment recently announced its latest advancement in their signature line of no-waste, Big Wheel Hog Feeders. 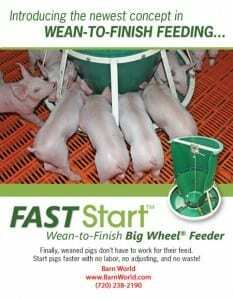 The Fast-Start, wean-to-finish feeder features all the no-waste feed saving aspects of the Big Wheel family of mechanical flow feeders but operates as a gravity flow for newly weaned pigs and then, as the pigs grow, it converts automatically from gravity to mechanical feed flow! When weaned pigs are put on the feeder, small slides in the feeder hopper bottom are open. As pigs grow, they begin turning a five spoke feed-wheel in the bottom of the trough which closes the slides on the feed hopper bottom. The turning of the feed wheel is what automatically converts the Fast-Start feeder from gravity to mechanical operation. 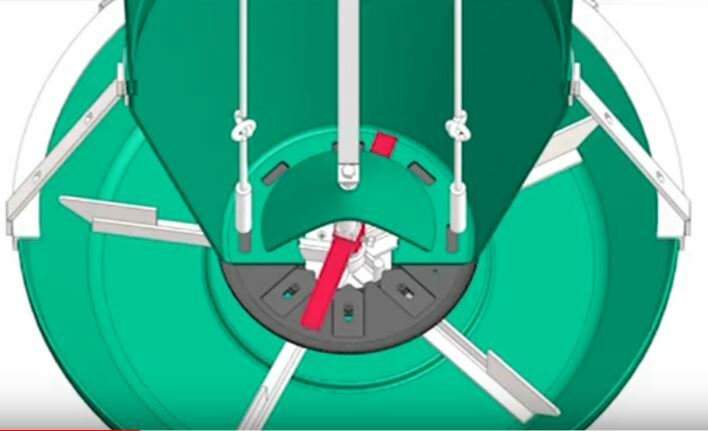 Once in mechanical mode, a feed-sweep located in the bottom of the feed hopper and attached to the feed wheel, sweeps feed past the cone and out of the hopper into the trough. Feed falls through the center hole in the trough where it is dispensed to the pigs. Once pigs are able to turn the feed wheel, the feeder makes it’s automatic conversion from gravity to mechanical flow. With the Fast-Start feeder, pigs receive all the great benefits of gravity flow feeding when they are small which provides access to fresh feed at all times. However, unlike traditional gravity fed feeders, no adjustment is ever necessary when the feeder is in gravity mode. Producers benefit from substantially reduced labor that is required to continually monitor and adjust traditional gravity flow feeders. With the Osobrne feeder, once the pigs turn the feed wheel, it automatically converts from gravity to mechanical flow. The mechanical flow design is the key to maximizing feed savings in finish feeding. No other feeding method can make the speed saving claims of the mechanical flow Big Wheel Feeders. Once the feeder converts to the mechanical flow mode and pigs stop eating, the feeder stops feeding which completely eliminates play waste. 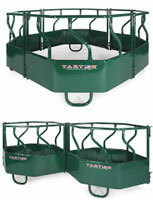 The round axis of the Big Wheel Feeders improve the feeding and growth performance of your animals. 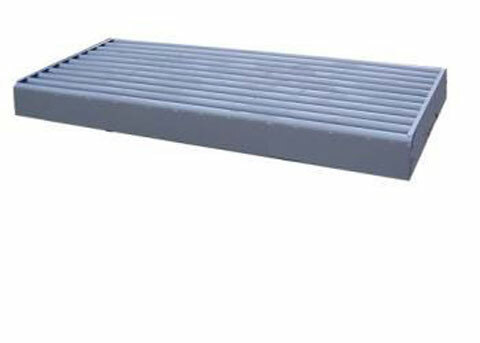 The feeder spreads animals radially around the self-cleaning trough which provides more standing room and less physical contact between the pigs. Conventional rectangular feeders force pigs into close contact with each other and often result in wasteful competition for the food. From Jeff Dorman: ‘I started raising hogs in 1983 and bought some of the first RO feeders from Osborne. Don’t know what year that was but a lot of them are the originals and are still on the farm. Then I moved into the nursery feeders and used them for close to 30 years probably. The first thing we noticed when I put them in there with the Fast-Start was that the feed was always there, especially the first pallets. So the pigs come in and they’re averaging about 13 pounds and I sort them down. The smaller group is around 10 pounds, some are up to 15 pounds but averaging around 13 pounds. Osborne’s latest innovation in pig feeding comes from over 30 years of research and development in finding the optimal way to feed pigs. 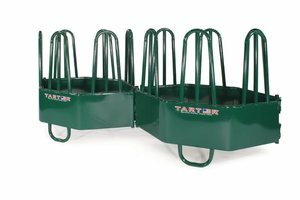 To see the Fast-Start feeder that converts from gravity to mechanical feeding automatically and all the Osborne pig feeder line-up, visit Barn World Livestock Supplies today! Barn Word has carried the industry-leading Osborne premium pig feeders and outdoor hog feeders for years now and leave it to them to set the bar high yet again with the introduction of the new Fast Start nursery-to-finishing feeder conversion feature. 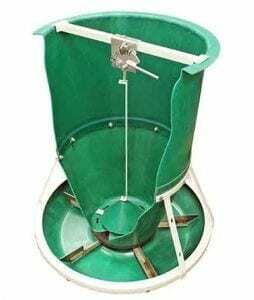 This innovation allows the feeder to start out as pure gravity feeder for you young ones and will automatically convert to an on-demand feeder to eliminate food waste as they grow. This saves money! The new Fast Start feeder conversion feature allows the benefits of a straight gravity feed for when the pigs are too small to turn a wheel and operate an on-demand feeder. While this young and small, they need a constant supply of feed for healthy weight gains and the gravity dispensing method the best for their needs. 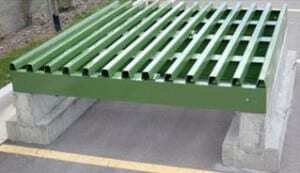 It ensures they have enough feed into the trough at all times for free feeding. As they eat, the new feed will fall directly in the trough and take it’s place. All is well and good until they gain a little size and start scattering food out of the trough during their new rough and tumble manners. As they grow into this larger size, it becomes necessary to feed them with an on-demand system to limit food and financial losses! As your pigs get bigger, they begin creating what’s sometimes referred to as ‘play waste’. Their more active and rowdy behavior can knock the feed right out of the trough were it gets trampled and wasted on the ground or floor. It’s at this time, when their size and activity dictates that they need a more response type feeder that the Osborne Fast Start feature automatically kicks in. 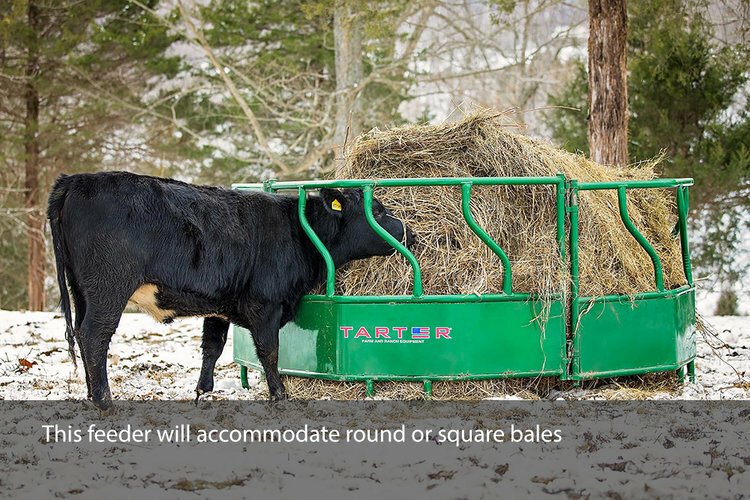 It converts from an open gravity feeder to an on-demand only feeder. As your large pigs feed, they will start bumping and pushing the paddle sweep that they couldn’t move before. This activity turns the feed bar paddle through the trough and begins the conversion of the feeder to an on-demand only system. As the sweep it moved around the trough, it beings to close the gravity feed holes used to freely dispense food. As these holes are gradually closed shut, the feed can only be dispensed is when the paddle sweep is moved and the conversion is complete. Food is only released when asked for which doesn’t allow for food to sit in the trough to be scattered or spoiled, helping to eliminate waste while still allowing your animals to eat whenever they need. Best of all, as the paddle sweep travels through the trough, it cleans it at the same time! Now you’re eliminating spoilage in the trough with the self-cleaning sweep paddles and dispensing feed only when called for. Self-cleaning and feeding only when needed will keep your operation clean and as waste free as possible which increases your profits!! While being an industry leading manufacturer of pig and hog feeders in the United States, Osborne has again come up with a unique and AUTOMATIC feed-saving feature to make your operation run a bit more smoothly. This new gravity to mechanical dispenser conversion, combined with the self-cleaning feature of the trough paddle sweep, makes these feeders some of the most popular in the industry. Visit Barn World or call (720) 238-2190 and get the best livestock supplies to ensure your farm and ranch operation runs as smoothly and as profitable as possible.